Happy Cat Sensitive Grain Free – Junior dry kibble is a great choice for cat owners that want to feed their kitten a grain free diet whilst ensuring that they are providing the best nutrition for their junior cat's development. This dry food provides baby cats aged 5 weeks and up with all of the nutrients that they need, and is highly suitable for those with sensitive digestion. This quality dry kitten food includes tasty poultry and potato, which make it easy to digest, and it also has a small kibble size, adapted to smaller kitten-sized teeth and jaws. Some cats are intolerant to grains in their diet, and this can also affect kittens. Happy Cat Sensitive Grain Free – Junior has been designed with this in mind, especially for young cats with sensitive tummies. Your kitten is sure to enjoy the flavour of the tasty kibble made with poultry and potato, and you can feed this food to him until he reaches 10-12 months of age. 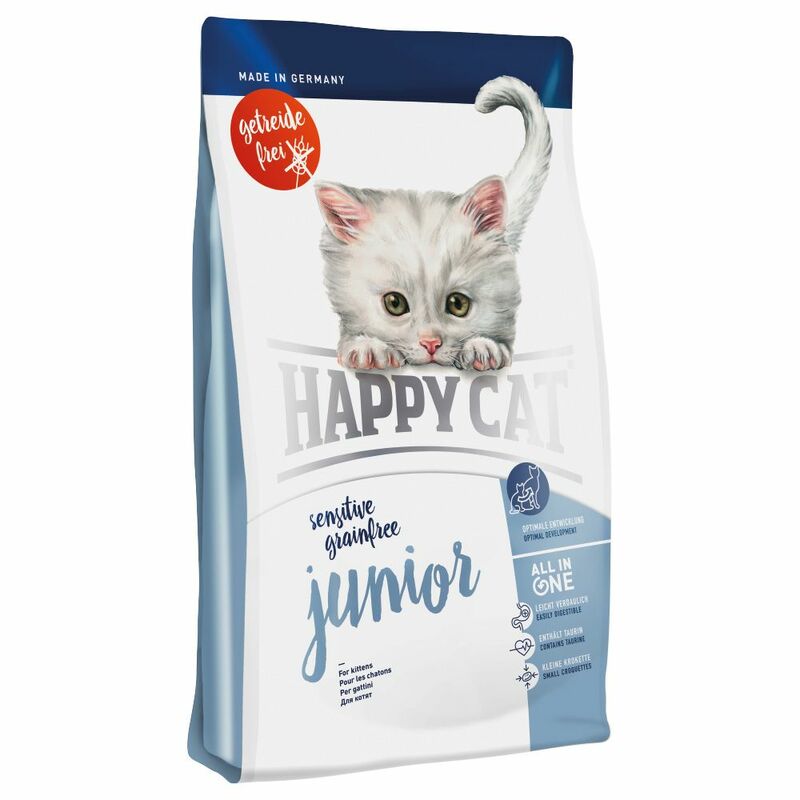 Happy Cat's revolutionary ALL IN ONE concept means that Happy Cat Sensitive Grain Free - Junior is complete and balanced. The kibble contains health-boosting ingredients such as herbs, linseeds, chicory, Omega-3 and Omega-6 fatty acids and taurine, and also contains compounds that help to manage hairballs, balance the pH value of the urinary tract and boost oral health. Added yucca schidigera extract helps to reduce the unpleasant smell of cat faeces. Happy Cat Sensitive Grain Free – Junior at a glance: Complete dry cat food for kittens and junior cats Suitable for kittens from 5 weeks: recipe especially formulated to promote healthy development Grain-free: easy to digest, with potato. Ideal for kittens with grain intolerances Small kibble size: makes it easy for your kitten to manage. Kibble also helps to maintain good oral hygiene by mechanically cleaning the teeth ALL IN ONE concept: provides your cat with all of the eΒential nutrients and vitamins that it needs Hairball control: higher fibre food to boost the transit of hair through the gut. It has a prebiotic effect which naturally protects against cell damage Seaweed: to help to strengthen the immune system, activate healthy gut flora and improve cell renewal Linseeds: rich in Omega-3 fatty acids to promote a healthy skin and coat. These seeds are also high in mucilages, that help to improve the digestion and reduce allergic symptoms Chicory: with..